Tylenol is nationally recognized and lauded as an easy fix for headaches and other everyday ailments. The drug, which contains an active ingredient of acetaminophen, is a common inclusion in medicine cabinets everywhere, and most people don’t think twice about popping a couple pills. But unfortunately, it’s easier than you’d think to accidentally overdose on Tylenol. In fact, acetaminophen is the most common drug overdose during pregnancy, and even worse: the damage it causes to the body can be passed on to the baby as well. In fact, overdosing can result in both maternal and fetal death. You can avoid this scenario by simply being educated about the effects of too much Tylenol during pregnancy, as well as knowing just how much is safe for you and your unborn baby. What makes too Much Acetaminophen Unsafe? While safe to ingest at certain dosage levels, acetaminophen can be toxic if taken in excess. Taking more than the recommended amount can cause acute (and potentially fatal) liver damage to both you and your baby due to a toxic compound called NAPQI that materializes when there is too much acetaminophen for the liver to process. Toxic levels of NAPQI can make their way through the placenta, with the possibility of causing fetal death if not treated in a timely manner. Other side effects of Tylenol overdose include kidney damage and anemia. Many people don’t realize they may be at risk for an overdose of acetaminophen because they take different products that contain it and therefore don’t consider the possibility of an overdose. People tend to think that Tylenol is for pain and fever reduction, while a product like Theraflu is used to relieve cold symptoms like sore throat and congestion. In fact, Theraflu and many other products contain acetaminophen. Make sure you check labels for acetaminophen dosage in every product you take. It’s always best to talk to your midwife about how much Tylenol is safe for you during pregnancy. 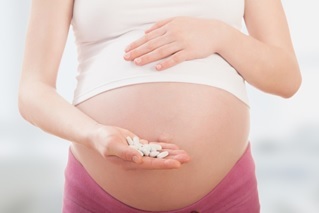 You should never take more than 4,000 mg of Tylenol per day (including any products containing acetaminophen), regardless of whether you’re pregnant. Different Tylenol products contain different dosage levels, so read those labels! It’s always a good rule of thumb to take the lowest dosage you require for the least amount of time. Acetaminophen is safe to take while you’re breastfeeding. The amount that can be transmitted through breast milk is extremely small and, in fact, smaller than the normal does given to babies. Just make sure you’re always keeping an eye on your dosage. Jen Juneau is a content writer for Drugwatch.com. She is dedicated to educating others on why it’s important to be aware of drugs and medical devices that could endanger their health. « Wake up, Czech Republic!